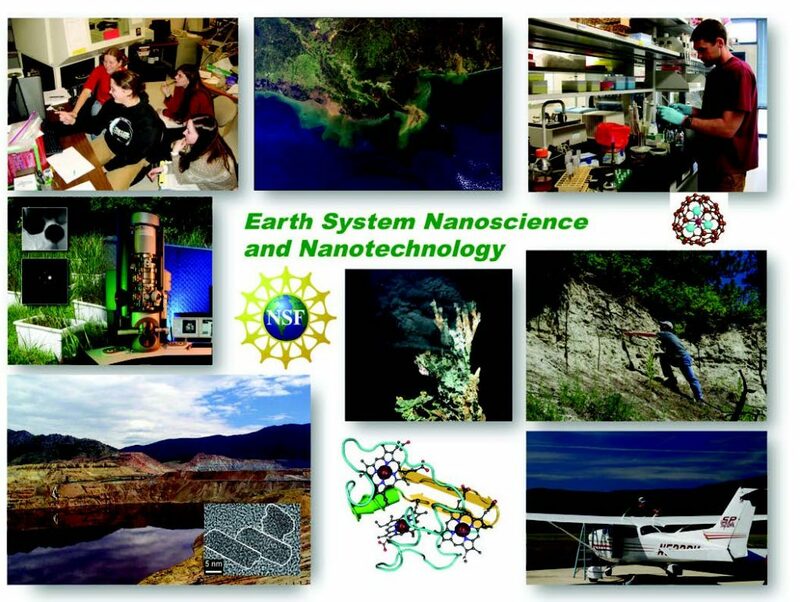 Earth system nanoscience and technology is highly relevant to all areas of Earth, ocean, and atmospheric sciences. Nanoscience, and the technology that stems from it (that is, nanoscience and technology), constitutes one of the great revolutions that originated in the twentieth century. Formally recognized in the late 1950s, it has grown to a present-day economy of nano-enabled products worth roughly US$1 trillion annually, which is expected to become US$3 trillion in 2020. The worldwide workforce in this economic sector is counted in the millions. Global government derived research and development funding is roughly US$10 billion annually, with publications in the neighborhood of 100,000 per year. In the fields of geo- and environmental nanosciences and technologies, the number of publications per year has increased by over two orders of magnitude in the last 25 years, making it one of the fastest-growing fields in all of nanoscale science and engineering. Development in this field is crucial because it is central to some of the most vital issues of the twenty-first century, including safe water, mineral and energy resource development, local/regional/global contaminant issues (including disease transmission), and global climate change. In September 2015, the US National Science Foundation (NSF) committed US$81 million to support sixteen National Nanotechnology Coordinated Infrastructure (NNCI) sites located throughout the US for the purpose of advancing nanoscale science and technology research. This NNCI network grew out of the NSF National Nanotechnology Infrastructure Network (NNIN) that ran from 2004 thru 2015. The new NNCI network marks the first time that Earth and environmental nanoscience and technology have been explicitly supported. In fact, three of the sixteen NNCI sites (Virginia Tech, Montana State University, and Stanford University) have geoscience concentrations and are supported by the Division of Earth Sciences’ Instrumentation and Facilities Program (EAR/IF) and the Directorate for Engineering at NSF. The three Earth and environmental NNCI sites are the Virginia Tech National Center for Earth and Environmental Nanotechnology Infrastructure (www.nce2ni.ictas.vt.edu), the Montana Nanotechnology Infrastructure at Montana State University (website under construction), and nano@Stanford (nanolabs.stanford.edu). These three NNCI are designed to provide cutting-edge laboratories and instrumentation to facilitate external scientific and engineering users in academia, government, and industry. The wide range of state-of-the-art facilities, instrumentation, and expertise in geo- and environmental science and engineering-related nanoscience and technology are available at a low cost to outside users. The vision for these NSF-stimulated user centers is to further accelerate the growth of nanoscience-related fields that are revolutionizing our understanding of the Earth. Unfortunately, in most academic Earth and environmental science departments, nanoscience and technology still play a relatively minor role, or no role at all. This is most apparent at the undergraduate level, but is also clearly seen at graduate levels and beyond. Nevertheless, the interest is broad and growing, as evidenced by the thousands of publications currently added to the scientific literature each year in these areas of research. Applications of Earth and environmental nanoscience range from fundamental to applied. Many applications have been slanted towards some of the most important geological and environmental issues of the day that relate to energy, water, climate change, pollution, and even earthquake mechanisms. A few examples of some of the current interests are the study of complex naturally-occurring nanomaterials at molecular and atomic scales, the global budget of inorganic nanoparticles and their overall role in Earth processes, nano-biogeochemistry processes within the critical zone, and the evolution and productivity of nanomaterials in soils and the oceans. Further, these fields include scientists and engineers who explore the complex interactions between manufactured nanomaterials and the natural environment in terms of water, air, and soil impact, as well as issues like waterborne contaminant uptake, greenhouse gas sequestration, and the development of nano-enabled sensors to revolutionize aquatic and atmospheric observations. Cumulatively, these NNCI facilities offer tens of thousands of square feet of laboratory and instrumentation space. They house a broad array of state-of-the-art electron- and ion-beam characterization tools, benchtop analytical tools, and extensive nanoparticle synthesis facilities. Most importantly, these centers have professors, research scientists, and skilled technical staff available to assist outside users. These experts are there to advise anyone from undergraduates through faculty researchers, as well as industrial scientists and engineers. Office space for visitors is also available. The low-cost users fees are highly subsidized by the individual universities and their research investments. Potential users are encouraged to check with the individual sites for specific infrastructure and capabilities by visiting the websites or using the contact information noted below. The potential for discovery and innovation within the Earth sciences using nanoscience and technology is enormous. These centers are available to assist users, from the novice to the most experienced, in these pursuits. Users working at the local, regional, and global scales—including land, atmospheric, water, and biological components of any subfield within the Earth and environmental sciences and engineering —are welcome to get involved. Users will enhance their ability to apply nanoscience and nanotechnology to help solve challenges in far-reaching and critical issues in all of the Earth sciences, including climate change, critical zone research, chemical oceanography, hydrology, ore deposits, paleoecology, paleontology, fault mechanics, fundamental aspects of mineralogy, geochemistry, petrology, geophysics research, medical mineralogy and geochemistry, and more. Nanoscience and technology goes far beyond analyzing targets at the nanoscale. It is also important to understand how chemical and physical behaviors change from the bulk to the nanoscale. Understanding these differences can be used to understand (in terms of the science) and to innovate (in terms of the technology) processes that can be applied to any aspect of the Earth and environmental sciences. Indeed, the scientific world is now resolved to the fact that nanoscience, like math, is relevant to all fields of science and technology. And it is making a tremendous difference in our scientific understanding in all fields. It is also accelerating interdisciplinary and transdisciplinary pursuits. Critical issues in science are rarely “owned” by a single field anymore, and it is nanoscience and technology that often link fields together in productive ways, adding new insights and solutions to important problems. As a result, the Earth, atmospheric, and ocean sciences are now primed to develop aggressively in these regards. If you want to add nanoscience and technology to your study of Earth and/or environmental processes, or if you already do so but want to do it more broadly, visit the websites listed above, and/or send an e-mail directly to Michael Hochella (hochella@vt.edu) at Virginia Tech; to David Mogk (mogk@ montana.edu) at Montana State University; or to Kate Maher (kmaher@stanford.edu) at Stanford University. No prior knowledge or expertise in nanoscience and technology is required! All are welcome.